We are quickly headed toward the holidays which means that winter weather will soon be winging its way toward us here in the Ashburn area. While Virginia tends to enjoy relatively mild winters in comparison with some parts of the country, many experts are predicting that this year will be even more full of precipitation than usual! As your tree care and maintenance experts in Ashburn, we’re here to educate you on how to get your trees ready to endure the harsh conditions of winter. Remember, when in doubt, it’s always better to call a tree service expert. Keep reading to learn more about why winter is so tough on trees and the tree care and maintenance tasks that go a long way toward protecting them. Every season has its ups and downs, with some bringing more challenges for trees than others. Depending on the species and where they were planted on your property, winter can be a particularly harsh season for trees. While trees are perfectly capable of surviving the cold, the wind, ice, and heavy snows that come along with winter are typically more damaging. 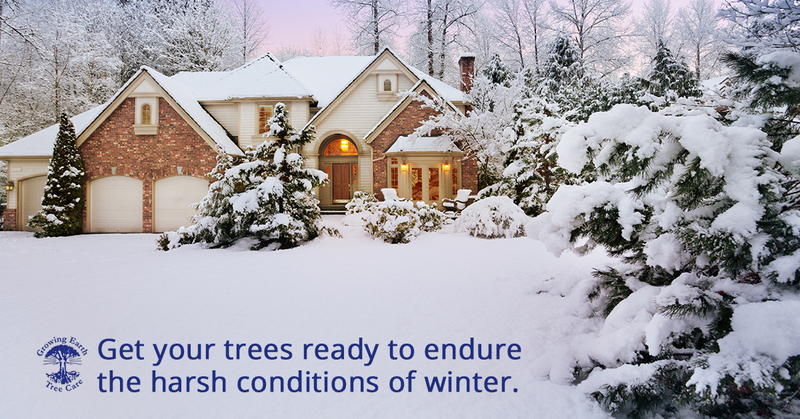 It only takes one heavy snowfall of six or more inches to put a serious strain on the branches of your trees. If you haven’t been keeping up with tree care and maintenance, loss of limbs or even the entire tree could be imminent. Save yourself the hassle (and high cost) of tree removal service by taking the time to perform these simple maintenance tasks before the snowflakes start to fly. Proper Care And Maintenance Keeps Trees Healthy All Winter Long! Water – Wait, isn’t snow basically water? Why would we tell you to water your trees when they’re about to be covered in the frozen version of the stuff? Because the potentially hydrating effect of snow won’t matter until spring when the ground freezes! Soil moisture is actually hard for trees to come by during the winter, which is why we recommend giving them a big drink before the temperatures drop. Mulch – Applying a fresh layer of mulch around your trees and shrubs is a great way to help them conserve moisture during the dry winter. Proper mulch application can enhance the soil biology and create a healthy environment that encourages root growth. If you’re not sure how to apply mulch (too much can be harmful! ), contact the experts at Growing Earth Tree Care. Prune – Overgrown or damaged/dying branches can become a nightmare when the high winds, snow, and ice of winter arrives in Virginia. That’s why we recommend that you contact a professional for tree pruning and trimming services before inclement weather becomes an issue. You’ll be glad you did when your neighbor is picking branches up off his yard and vehicles, but you’re sitting pretty! Growing Earth Tree Care is your source for full-service tree care and maintenance services in Ashburn. Contact us to learn more about how we can keep your trees healthy all year long!